Well that certainly wasn’t the wind! Five minutes ago I’m sitting at my computer doing some work and my desk starts to jiggle. The water in the glass of water beside me is trembling. My apartment seems to lurch slightly like someone has backed a car into it. 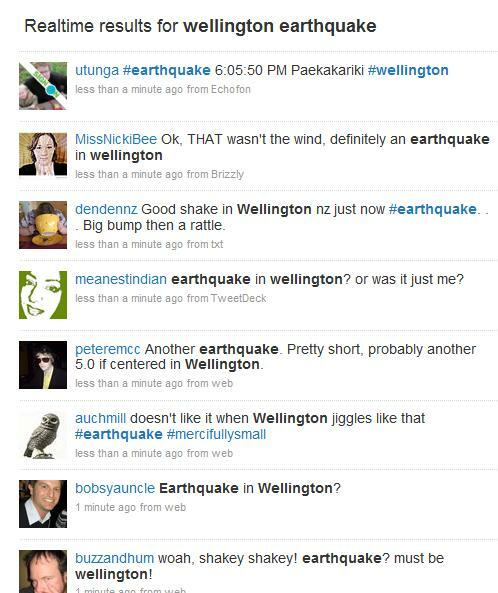 And that’s it, another quake felt in the shaky city. And that’s all within a minute of it happening. This is the most fascinating aspect of Twitter – the usefulness of it in crowdsourcing confirmation of events in real-time. Now if only the Geonet website was that responsive! 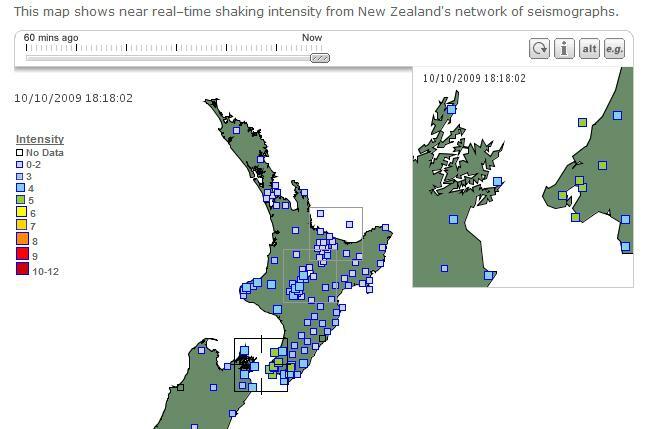 As it happens, the Geonet website refreshed with the latest data at 6.17pm – revealing seismographs in the Wellington region showing a magnitude 5 quake…. All of this just serves as another reminder that I need to get my act together on some emergency preparedness here at home on the Terrace – the centre of the faultline cutting through Wellington. After some prodding from staff at work I finally bought a survival pack for the office. But my survival pack at home consists of a few motley cans of fruit and vegetables – no torch, no medical supplies, no matches. I’ve experienced two what I would consider reasonably-sized earthquakes in my life. The first was in 2001, courtesy of the San Andreas faultline – in San Jose, California. I was about 30 floors up in the Hilton Hotel filing a story to the Herald on my visit to the Intel chip fab plant. The tall, thin building started to sway. I sat there and did nothing until the building stopped swaying. My instinct for danger wasn’t any better a couple of years later in Tokyo when I was lying in bed late one night watching TV and the building started to sway, and kept swaying. Car alarms went off. Someone screamed in the hallway outside. What did I do? Stayed in bed! Anyway, some interesting reading here on the angry events of the Ring of Fire in the last couple of weeks and some speculation on whether these events are related.